Historical Background: The War of 1812 has been nearly forgotten in the US. Few Americans realize the "Star-Spangled Banner" is about the War of 1812. The declaration of war was controversial at the time, and the war ended as a stalemate, resolving none of the issues that started it. Several attempts to invade Canada ended in failure. While American privateers harassed British shipping, the Royal Navy blockaded the East Coast. In 1814 the British marched on Washington DC and set the White House on fire. The US won important naval battles on Lake Erie and Lake Champlain, saving the country from a costly defeat. The most famous battle, Andrew Jackson's victory at New Orleans, was fought after the peace treaty was signed ending the war. The battle of Chippawa (1814) was a landmark victory for the US army, marking the first time it defeated the veteran British regulars in open combat. When Winfield Scott's grey jacketed 1st Brigade was first seen the British may have mistaken them for militia. Watching them under fire, however, it became obvious that they were in fact well trained regulars. The US and British lines faced each other at close range, exchanging musket and cannon fire. After both sides suffered terrible casualties it was the British that withdrew. Battle 1: The British deployed their light infantry, militia, and native warriors in the woods with their dragoons in open ground nearby. The Americans also deployed their militia, native warriors, and dragoons on that side of the battlefield. The Americans fielded a strong right flank, planning to defeat the British left and roll up their line. The British responded immediately and extended their left, deploying their reserves. In the woods the American's native warriors advanced aggressively and threatened to break through the British militia. But the light infantry stopped them cold. Colonel Pearson was killed in the skirmish, so General Riall sent Major Evans to take command in the woods. Riall was counting on a victory on that flank. Evans sent his native warriors around the flank of the befuddled American militia and the American position soon became untenable. Resistance crumbled, and the British took control of the woods, threatening the American left flank. The Americans were having better success on the open ground. They put relentless pressure on the British left until all the British reserves had been committed. The British made the mistake of advancing too quickly and were ripped by close range American cannon fire. The British left collapsed, threatening the whole British line. Both sides were in the same position - they had turned the enemy flank, but were being beaten on the opposite flank. The victory would go to the side that could exploit their advantage the best. The Americans deployed three cannons, backed by their dragoons, to rake the tree line. The dragoons and artillerymen came under murderous sniper fire from the British units in the woods. The dragoons were driven away, leaving the cannons unprotected. The British jumped on the opportunity. Their light dragoons charged into the rear of the hapless artillerymen, scattering them. Then the British dragoons turned and charged off the US dragoons. On the other side of the battle field the Americans were having similar success, methodically rolling up the British line. British resistance on that flank collapsed when Colonel Hay was killed. Both sides had suffered high casualties, but which side would withdraw. In the end it was the Americans that were forced to retreat, barely, resulting in a close fought British victory. Building the Armies: Right now there aren't any 1/72 plastic soldiers designed for the War of 1812 but Imex should be releasing some soon. 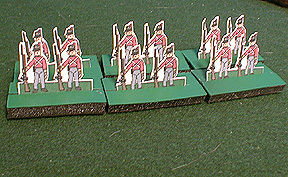 British infantry and artillery from one of the Napoleonic sets could be used for regulars and artillerymen on both sides. 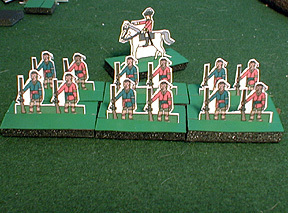 Some figures suitable for militia can be found in the Imex Alamo Defenders set. Hat's Napoleonic KGL Light Dragoons could be used for the British dragoons, and Italeri's Napoleonic French Dragoons could pass for the US dragoons (cut the knob off the helmet crest). Nikolai has a Woodland Indians range that includes a 5 figure set called "Warriors Fighting" that is suitable. I suppose you could pick a few of the better poses from Revell's Indians, or Imex's Sioux Indians. 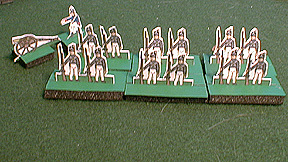 Chris Johnson suggests the following: American and British Commanders-use the British Staff Officer set, American Artillery-use British figures for the crew, but French (double trail) carriages, American Regular Infantry-use British figures (with the Belgic shako) right out of the box, American Militia-frontier-types from the Alamo Defenders and/or American Revolution sets (most actually wore a sort of "top hat", but nobody makes them so far), American Regular Dragoons-use French dragoons, British Infantry and Artillery-use Waterloo-era figures (Belgic shako), Canadian Infantry-use either British Rifles or earlier British Regulars (stovepipe shako), British Dragoons-use Waterloo-era figures (shako), Canadian Dragoons-use earlier British dragoons (Tarleton helmet); may have to use spare RHA riders. (American Militia Dragoons wore these also.) Here are some paper soldiers you can print and use. 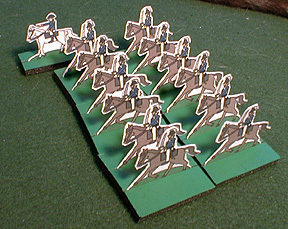 Infantry and cavalry are mounted two per base. Cavalry bases are 1.5" square, infantry bases are 3/4" x 1.5". Commanders are based singly on 3/4" x 1.5" bases. The Map: The battle was played on a 5' x 7.5' table. The battlefield is open and flat terrain except for the woods in the west. The woods can be drawn in marker, marked by a piece of green felt, or represented however you choose. Deployment: The US and British deploy as shown on the map. Only Militia, Native Warriors, and British Light Infantry may start in the woods. Orders of Battle: All units have six bases. The British organization has been changed to create additional commands. The 1st, 8th, and 100th Foot were brigaded together under Gen. Riall. Winfield Scott has been listed as overall commander for the US, although this position was held by Major General Jacob Brown. Scott was the commander on the battlefield, and largely responsible for the victory, and so I've given him credit. All units have six bases, Each cannon is a single gun model and one base of artillery crew. Formations: There are only two formations for regular infantry - line and column. The names of these formations can be very confusing for the students. At school, when they are told to "get in line" they line up one behind the other, in what we call column formation. With the kids I call the formations "firing line" (like a firing squad), and "marching column." Lines may be single or double rank, and may bend. Columns are single company. Units may change formation at the start or end of their movement, but can only change formation once per turn. Dragoons stay in line formation at all times. Militia and Native Warriors are always in line formation (actually a loose skirmish formation, but we'll represent it with line formation). Cannons don't have formations. Movement: Militia and Native Warriors move 6". Regular Infantry can move 6" if they are in line formation or 12" if they are in column formation. Dragoons and Commanders may move 12". Cannons can move 12" but may not fire on a turn when it was moved. A cannon which has moved and cannot fire should point away from the enemy. Cannons can pivot in place during movement and still fire. Units may not move within 1" of an enemy unit except when charging. Fire: Infantry that are in line formation and artillery that didn't move this turn may fire. Range is measured from the center of a unit to the nearest part of the target unit. Units may only fire to the front and may not fire through narrow gaps between friendly units. Roll one die per infantry base or four dice per cannon. The chart indicates the number needed for a hit. Remove one base for each hit rolled by the firing unit. It takes three hits in the same turn to remove a cannon. Note that you only use the 1" firing column when shooting at a charging unit. If a unit is reduced to a single surviving base then the last base is immediately removed. Units in column are good targets. Roll two extra dice when shooting at columns. Charges: Both sides may charge during the charge phase. If it matters the British charge first. Cavalry can charge 12", infantry can charge 6". Cannons do not charge. A unit may not declare a charge unless it is in line formation and can reach an enemy unit.. A player may measure to see if a unit is within charge range. One enemy unit must be chosen as the target of the charge. A unit that wishes to charge must first pass a morale check. If the unit fails moral nothing happens, it cannot charge this turn. If the unit passes its morale check then the target must pass a morale check. If the target fails it loses one base and immediately retreats 12", the charging unit is moved into the position vacated by the retreating target unit. If artillery is the target and it fails morale it is eliminated. If the target passes the morale check it has the option of firing at the chargers or counter charging. If the unit counter charges the two units meet in the middle and fight a melee. If the target decides to fire at the chargers it does so at a range of 1". If the charging unit survives the fire it moves into contact with the target and they fight a melee. Melee: If a charging unit contacts an enemy unit there will be a melee. Each side rolls a die and applies the modifiers. High roll wins. The loser removes a stand and retreats 12". If the roll is a tie each side removes a stand and rolls again. A cannon counts as three bases in melee. The Woods: During the battle the commanders used their militia, native warriors, and light infantry for skirmishing in the woods. If units of this type are in the woods and are shot at by an enemy unit outside the woods they get saving throws. Roll 1D6 for each hit, ignore the hit if the saving roll is a 4 - 6. There are no saves against fire from within the woods. Cannons and cavalry are not allowed into the woods. Regular infantry may not use column formation in the woods. The Perfect Captain web site has a set of rules for the War of 1812 called "Cousin Jonathan," and a Chippawa scenario with a map and order of battle.